Do 10 Asian and African rivers generate 90% of plastic trash in the ocean? Americans are being told we must risk our health with expensive, awkward reusable or paper straws. All because of this suffering turtle. But in real life, this turtle was found near Costa Rica, not the US. And Costa Rica dumps its trash directly into rivers and the ocean. The US never does that. It's been banned by Federal law for 45 years. Discard your straw in a normal trash receptical (sic), and turtles are safe. Americans create almost none of the ocean's plastic. By analyzing the waste found in the rivers and surrounding landscape, researchers were able to estimate that just 10 river systems carry 90% of the plastic that ends up in the ocean. While I can imagine that third-world countries might not have well-established waste disposal processes, 90% sounds exaggerated. Almost 90% of plastic debris that pollutes ocean water, which translates to 5.6 million tons, comes from ocean-based sources. Merchant ships expel cargo, sewage, used medical equipment, and other types of waste that contain plastic into the ocean. Naval and research vessels eject waste and military equipment that are deemed unnecessary. Pleasure crafts release fishing gear and other types of waste, either accidentally or through negligent handling. The largest ocean-based source of plastic pollution is discarded fishing gear (including traps and nets), estimated to be up to 90% of plastic debris in some areas. Approximately 0.8 million tons annually of marine debris, which is 12% of the total debris input into the oceans, originates from land-based sources, and primarily consists of discarded plastic items (user plastic). In highly populated areas, marine debris comes primarily from the land. So what about that study? We analyzed a global compilation of data on plastic debris in the water column across a wide range of river sizes. Plastic debris loads, both microplastic (particles <5 mm) and macroplastic (particles >5 mm) are positively related to the mismanaged plastic waste (MMPW) generated in the river catchments. This relationship is nonlinear where large rivers with population-rich catchments delivering a disproportionately higher fraction of MMPW into the sea. The 10 top-ranked rivers transport 88–95% of the global load into the sea. In other words: they did not examine the ocean, they examined rivers. And their number does not say that 88-95% of the plastic that has ended up in the ocean comes from these 10 rivers, but that of the Mismanaged Plastic Waste that rivers in particular contribute to the oceanic plastic pollution, these 10 rivers account for 88-95% of that contribution. But(!) as the study above says, rivers and other land-based sources of oceanic plastic waste account for 10-12% of the total plastic waste in the ocean. @MadScientist concludes that the Wikipedia quote may be erroneous, and the 90% figure may be off by a bit. This however does not change the fact that Export of Plastic Debris by Rivers into the Sea does not deal with all plastic waste that end up on the oceans but only that which arrives by river. 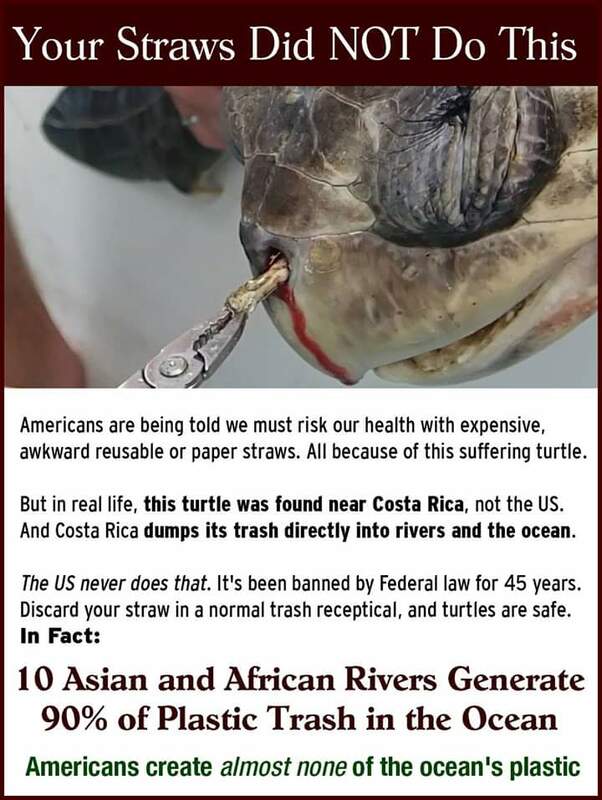 This — by all means — strengthens the original claim that it is in all likelihood not "your" straw that ended up in the nose of this unlucky turtle unless you were carelessly discarding it directly into the ocean or nearby that. Never the less the facts stated are misinterpreted and rivers are not the only and probably not even the majority sources of plastic pollution in oceans as a whole other than in the immediate vicinity of where rivers discharge into the sea. No, plastic in those rivers can have come from a different country. ..Therefore, the rivers might be Asian/African, the plastic is not (therefore, the responsibility of it being recycled does not fall solely on those countries). MichaelK's answer is excellent. I would just like to add the fact that there are a few articles around stating that 'developed' countries are even exporting recycled, plastic and other such to other less developed ones (basically pay other countries to accept it). So the stats a study might have become even more obscured. Not about plastic so much, but e-waste article from Greenpeace: Where does e-waste end up? The BBC: Reality Check: How much plastic do we send to China? Further, it is suggested that the 'recycled' plastic which is exported, often ends up in a state which is no longer recycle-able. 'In countries like India, waste pickers sort through the trash to find the pieces that are most valuable—thicker plastics and metals. The remainder becomes landfilled or incinerated, creating a health crisis for communities. Local waterways act like conveyor belts, sending plastic straight out to sea.' Think you're doing your part by recycling?. America generates 50% of the world's plastic trash. When China banned recycling for foreign countries earlier this year, trash started piling up all over ports in the United States. It was deemed as a crisis in many states. Wall Street Journal and many other outlets did a pretty extensive coverage on this issue, and there are some very good video documentaries too. Not the answer you're looking for? Browse other questions tagged environment geography plastic . Is banning plastic bags beneficial to the environment? Are Americans ignorant of geography and the world? Did Canada go from 2.5 million protected lakes and rivers, to just 159? Do the plastic shade balls in Los Angeles leach chemicals into water? Did the Standing Rock protestors potentially damage the environment and the local watershed through their own human waste and garbage? In Miami, can you see fish from the ocean swim on the streets because of the sea level rise? Do Starbucks' new lids use more plastic than the previous lids plus straws? Are drinking straws a minor source of ocean plastic pollution?